Whether it’s solitary, cooperative or imaginary, for children, every form of play is a learning experience. Kids table and chairs are simply a piece of furniture or a nice-to-have item for us adults, but for them, it’s a tea party with their teddies, a place to create artwork and build puzzles or to sit with friends, just ‘shooting the breeze’ and socializing. I myself have had many a lunch or high tea with my daughter, where I’ve sipped on diluted fruit juice and pretended to eat sand cookies. I’ve also spent hours attempting to build a puzzle with a rather impatient four-year-old. A kids table and chairs set isn’t only a practical addition to a playroom or bedroom, but it’s the perfect place to encourage organized and imaginary play, as well as allow you to create some awesome memories with your kiddos. No ‘top list’ is complete without a mention of Little Tikes. 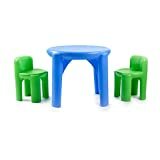 This table and chair set is perfectly sized for toddlers, perfectly priced for parents and perfect for any room in the house. It’s light enough to be moved from room to room but sturdy enough to not topple over and injure anyone. The seamless table makes it perfect for little ones to do art and crafts, building activities, host a tea party or eat a (real) meal. And it’s super-duper easy to clean. Always a bonus when you have little ones. 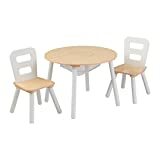 I love this kids table and chairs set from KidKraft. It’s spot on in terms of looks, with the combination of the pine and white, and will suit any room’s existing color scheme. Although some people aren’t mad about it, I personally love the ‘hole in the middle’ with the netting. It makes for easy tidying up and favorite toys or crayons and pencils are easily accessible. I also thought it makes the table more practical, letting the kids play but also eat at their little table. How sweet is this table and chair set? It is extremely durable and will last a long, long time and the gender-neutral colors mean you can pass it down the sibling line, as your family grows. The lipped table stops things from rolling or sliding off and the easy-to-clean surface makes it ideal for messy play, or eating. The ‘x’ design means it’s incredibly stable, and guests at the next teddy bear party aren’t going to be falling off chairs or knocking the table over. 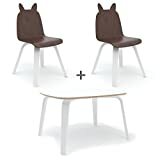 Let me say now that this Oeuf Rabbit and Bear Ears table and chair set making my top list has nothing to do with it being eco-friendly, that the finishes are non-toxic, water-based and free of VOC health hazards and that it will last as your children grow because of the excellent quality. But it’s got everything to do with the super cute rabbit and bear-eared chairs; the fabric stickers, (sold separately) that will inspire your children to personalize them with eyes, mouths, and accessories and Oeuf’s trademark clean modern aesthetic design which means it looks awesome in any house or room. It’s easy to see why this is a best seller and comes highly recommended by other review pages and parents. Obviously not your typical kids table and chair set, this picnic table seating for four children, is built for both in and outdoor use. It folds flat for easy storage, is UV protected and it won’t crack or peel. Also, the steel frame has an all-weather finish. It’s a great product that will last even the toughest conditions and it comes with a limited warranty. The 5-piece furniture set from ECR4Kids is ideal for one adult and four children. The chairs are ergonomically designed to encourage good posture and the durable hardwood furniture features smooth and rounded edges for safety. 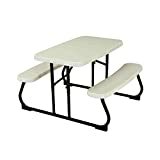 The kids table and chairs will look good in any learning environment, as well as at home, or even at the doctor’s rooms, and the comfy cushions are removable, making them easy to clean. When I first saw the activity table for four, I thought ‘who the heck would need this?’ and then I remembered there are families with multiples, and there are playschools and preschools where the Toddler Tables 4 Seat Space Saver Activity Table would be absolutely essential. It maximizes the space you have available and keeps your kiddies safe, in one place all at the same time. 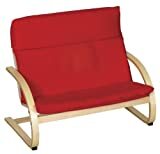 The removable seats are made from easy-to-clean molded polyethylene and feature a safety belt for added security. The table tops are laminated over wood, making cleaning easy and the heavy-duty tubular steel legs can be fixed at either 14 or 27 inches high. 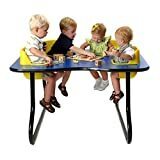 The attention to safety and quality make the activity tables a great addition to a preschool, a daycare or happy home filled with lots and lots of children. Have any kids table and chairs sets your kids love? Let us know your recommendations in the comments below! Feature image courtesy of Flickr, PINTOY®.